Our passion for music does!!! A Can-Do Muso is a musician with challenges who is very passionate about their music. We use the word "challenges" with Can-Do Musos because, quite often disability gets mis-interpreted as inability. People with challenges can overcome them and be empowered and successful. Can Do Musos was established to promote and support musicians who face "challenges" in their lives from all over the world. Renee Kelly is young woman from Brisbane, Australia who started life with a huge disadvantage... a tiny 620 gm birth weight and hopelessly under-developed heart and lungs. She had only a very slim chance of survival... but survive she did. Now Renee is making her mark on life, despite a disability that would have deterred the most determined of spirits. If you are a passionate musician who lives with a disability, and would like to share your story across the globe, whether you play drums, guitar, sing, play sax, or even sousaphone, we would love to hear from you. Please when giving us information, give us as much information as you can, and make it your story. Each week, THE CAN-DO RADIO SHOW will feature music, gigs and interviews from musicians who each have a challenge to overcome. We only play music from artists featured on this website. Hosted by Andrew Hewitt. The show is podcasted via Podomatic. Can-Do Musos YouTube Channel features music videos from musicians living with disability from all over the world. Please subscribe to our Youtube channel by clicking the button below and thank you for your support. Keep further up to date with our Can-Do Musical Notes newsletter. 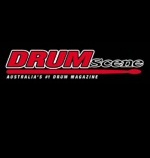 Can-Do Musos are proud to be featured in the latest issue of Drumscene Magazine Australia. 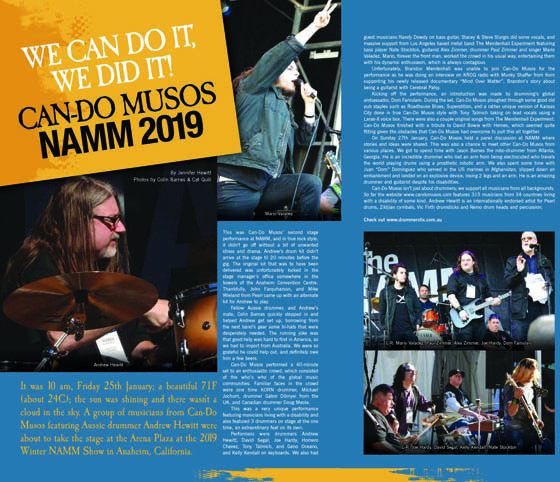 The feature covers our recent NAMM Show performance in Anaheim, California and was written by Jennifer Hewitt, photos were taken by Colin Barnes and Cat Quill. A special thank you to Frank, Rosanna and the staff at Drumscene for their ongoing support for Can-Do Musos. 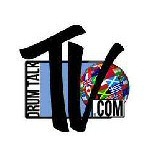 For more information, please go to www.drumscene.com.au. Can-Do Musos rocked the Arena Plaza Stage at the 2019 Winter NAMM Show on Friday 25th January in Anaheim, California. The set was finished with a rocking tribute to David Bowie with "We can be heroes". Performing were Andrew Hewitt, Joe Hardy, David Segal, Homero Chavez, Kelly Kendall, Geno Oceano, Paul Zimmer, Tony Talmich, Alex Zimmer, Nate Stockton, Steve Sturgis, Stacey Sturgis, Randy Dowdy and Mario Valadez. A special thanks to The Mendenhall Experiment, Randy Dowdy & Steve & Stacey Sturgis for their support. On Sunday 27th January, Can-Do Musos hosted our annual NAMM Panel Discussion at the Anaheim Hilton. On the panel representing Can-Do Musos were David Segal, Andrew Hewitt, Joe Hardy, Brandon Mendenhall, Nate Stockton, Jeffrey Blattner, Jason Barnes, Tony Talmich, Dean Zimmer, Geno Oceano and Juan "Dom" Domingez. To watch the full performance from the Arena Plaza, check out the performance on Vimeo. Dom Famularo speaks about Can-Do Musos to Port Jefferson Special Education PTA from Long Island, New York. Based on the popularity of the Can-Do Radio Show, we decided in December 2015 to launch Can-Do Musos TV via a channel on Vimeo. 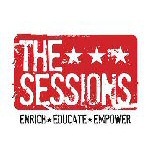 This gives an opportunity for musicians with a disability to be seen all over the world performing, whether it be live gig videos, official production videos and even tv appearances. Hosted by Andrew Hewitt. 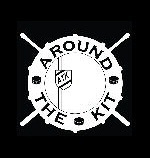 Check out all the episodes on Vimeo. On the 18th May 2018, David Segal addressed a group of investors at the Yale Club in New York City. Can-Do Musos is now a registered 501(c)(3) non-profit charity and looking for investors and donations to help us grow and move into the future. What Disability? We're just drummers from Down Under drum clinic presented by Dr Paradiddles Wonder Drumporium, Just Music Berlin and Can-Do Musos, featuring all Australian drummers on one night at the Sky Live Club on top of Just Music Berlin, Germany. Performers were Todd James, Buck-It, Josh Hogan from band Rudely Interrupted, and Andrew Hewitt. Dom Famularo popped in to talk to the audience via Skype. The clinic was organised via months of facebook chats between Andrew Hewitt, Rich Millin, and Todd James with a vision in mind. Andrew Hewitt and Josh Hogan were in Berlin as part of the Berlin & Australia Exchange Project 2017 for Arts Access Australia. A special thanks to Rich Millin, Jan Draheim, Arts Access Australia, Pearl Drums Europe, Zildjian Cymbals, Vic Firth Drumsticks and Remo Drumheads & Percussion. Can-Do Musos were represented at The NAMM Show in Anaheim, California from the 19th - 22nd January 2017. On the 19th January at 11am, 9 Can-Do Musos from 4 countries performed together on NAMM's Center Stage. Performing were: Andrew Hewitt (AUS), David Segal (USA), Joe Hardy (USA), Mark Goffeney (USA), Dean Zimmer (USA), Carlos Guevara (VEN), Braulio Morales (CHL), Brandon Mendenhall (USA), Nate Stockton (USA), Mario Valadez (USA), Homnero Chavez (USA), a special thanks to Mike Lira for stepping up on guitar while Mark was unavoidably detained. On Sunday 22nd January at 3pm, we had our usual Sunday afternoon session in TEC Tracks. Those presenting were: Andrew Hewitt (AUS), David Segal (USA), Joe Hardy (USA), Mark Goffeney (USA), Brandon Mendenhall (USA), Nate Stockton (USA), Lourdes Mack (USA), Braulio Morales (CHL) and Jeffrey Blattner (USA). Brandon, Nate, and Mario from The Mendenhall Experiment interviewed after our Sunday session by David Ward from Musicians on the Record. If you do one thing for Andrew Hewitt on this International Day of People with Disability, it is this: park your sympathy at the door. "Don't feel sorry for me. Because I don't," he said. Australian Can-Do Musos founding member, Andrew Hewitt was honoured with a story about him, drumming,teaching and Can-Do Musos nationwide across Australia on ABC-TV News 24 and ABC-Radio. Along with Andrew, in the video is Can-Do Muso, David Rowlands. A special thanks to Norman Hermant from the ABC for compiling the story. Andrew's interview was also heard on ABC Radio's AM Show and is in "print" on ABC News website. In May 2016, some of our Can-Do Musos members travelled to London (UK) to be part of a promotion for Channel 4 TV London. We're The Superhumans to benefit the British Paralympics Team. The promotion was launched on July 14 2016. Can-Do Musos members involved in the project are: Tony Dee and Neill Duncan from Australia, Alvin Law from Canada, Marc Playle from England, Greg Anton, Bill Clements, Sujeet Desai, Mark Goffeney, Patrick Henry Hughes, and Dean Zimmer from the United States. Congratulations on the growth of Can-Do, you've got to be proud of what you are building. Your tireless efforts are inspiring players around the world. Can-Do Musos has been of great benefit to me in my ongoing challenge of an acquired brain injury. It has helped me to focus on writing songs and performing them because I am unable to focus on reading books or watching movies. The activity has helped me to maintain positive mental health. I enjoy performing my songs and playing music with other Can-Do Musos. It is very comforting to know that there are other people with disability who have found new skills and overcome their challenges. I have seen the positive benefits in networking with and socialising with other Can-Do Musos. 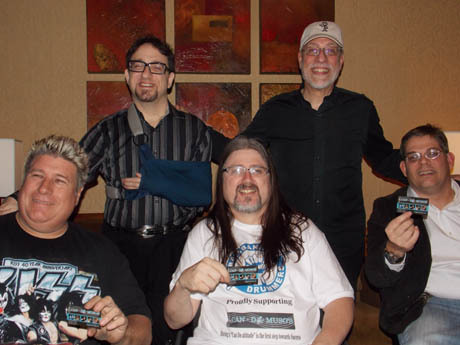 This organization is unique and run by a dedicated group of musicians who understand the needs of people with disability. Can-Do Musos has made myself and my music so much more visible to others. They allowed me to post about not only my disabilities, but how I accomplish writing, performing and recording my music which is a great accomplishment. I had a library find out about my music and as a result, they asked me to play at their library for their patrons in a series of performances of 'Musician's with Disabilities Who Have Overcome Them' and I got paid very well. Their website has brought many other people to my Music Website and I have made any new contacts with other musicians in my area. On top of that, one of the founder's, Andrew Hewitt, has helped me delve into a new field (drums) with tips and assistance when I asked for it. He is very accomplished on the drums and it shows through his advice and the videos I have seen of his performances. If there was only one organization that I could belong to, it would be Can-Do Musos. They are geared for the Musician that has everything against him (or her) and gives his (or her) all into their music. They also are there for those that are struggling and need a little help... a little push... to progress in the field of music.